The President's Commission on Combating Drug Addiction and the Opioid Crisis, a blue ribbon panel led by Gov. Chris Christie (R., N.J.) and tasked with developing ways to combat the opioid crisis, released a draft of its final report to President Donald Trump on Wednesday. "The reason behind the urgent recommendations presented to you today by this Commission is that the leading cause of unintentional death in the United States is now drug overdose deaths," wrote Christie in an opening letter to Trump. "Without comprehensive action, including your national public health emergency, the death count will continue to rise. I know that is unacceptable to you. I know you will win this fight for the people who elected you." 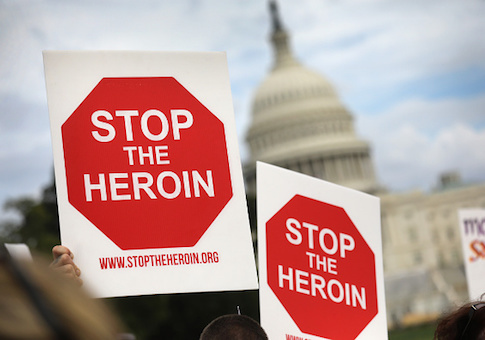 The report follows Trump’s designation of the opioid epidemic as a public health crisis last week, lowering some regulatory barriers that stood in the way of addressing addiction deaths. Trump stopped short of designating the epidemic a national emergency, as the commission recommended in July. The new report does not call for an upping of the designation. However, it does call on Congress to restart the Public Health Emergency Fund, which provides money to fight public health crises, but has been unfunded in the past several years. It also calls for block granting funds for the epidemic to the states. "Creating uniform block grants would allow more resources to be spent on administering life-saving programs. This was a request to the commission by nearly every governor, regardless of party, across the country," write the commission members. Beyond additional funding, a centerpiece of the commission's proposal is an "expansive national multi-media campaign" to combat opioid use. The report pointed to the success of projects like Idaho's Meth Project, which helped contribute to a 56 percent decline in teenage meth use. A federal campaign, the commission noted, could be modeled after the FDA's anti-smoking campaign, "The Real Cost," which was associated with a 30 percent decrease in smoking initiation of Americans between 11 and 18. The effectiveness of such campaigns has been contentious. Attorney General Jeff Sessions drew criticism from the left when he suggested bringing back D.A.R.E., the anti-drug education program from 1980s. Programs like the mid-2000s National Youth Anti-Drug Media Campaign have had questionable success, with an NIH study finding that the NYADMC had no short-run effects and may have encouraged teens to use marijuana in the long-run. "It completely depends on how it's rolled out," said Carrie Wade, harm reduction policy director for the R Street Institute. "Some campaigns, there's a lot of controversy that they actually work. The [D.A.R.E.] campaign was completely ineffective. … But the truth initiatives campaign for nicotine, there's evidence that show those actually work." "As an overall thing, it's probably putting a lot of money and funding into something that is not going to be very effective, but it totally depends on how it’s rolled out," she said. Drug courts are also central to the commission's vision. These so-called "alternative-to-incarceration courts" address minor drug-associated crimes through suspended sentences and mandatory treatment, rather than shuffling addicts through the prison system. A report from the U.S. Sentencing Commission notes that they are the "longest running and most prevalent of all state problem-solving courts," with at least 2,000 at the state level. The commission called for drug courts to be established in all 93 federal district courts, and for state and local courts to apply for funding grants. They note "44% of U.S. Counties do not have an adult drug court." Dr. Sally Satel, a practicing physician and resident scholar at the American Enterprise Institute, told the Free Beacon she "strongly supports drug courts." "One of the biggest problem with treatment is that dropout rates are very high, up to 60 percent in 6 months," Satel said. "People need at least one year of serious treatment with supervision. If they have committed a crime … then they are eligible for drug courts and that option is a boon for them." Another proponent of drug courts is David Murray, co-director of the Center for Substance Abuse Policy Research. Murray explained to the Free Beacon that drug courts allow for the intersection of criminal and health concerns in one space. "They're in principle the right thing. This is both a criminal justice and a public health urgency. So use the full scope of tools that criminal justice and public health can be brought to bear here," he said. Drug enforcement also plays a role in the commission's plan. The opioid epidemic has in the past several years been substantially exacerbated by fentanyl, a highly potent opioid 50 times stronger than heroin. Fentanyl and its analogues are responsible for 40 percent of opioid overdose deaths in 2016. While many prescription opioid overdoses are due to domestic criminal behavior, fentanyl is often trafficked internationally, especially by the Chinese. In response, the commission called for "enhanced penalties for trafficking of fentanyl and fentanyl analogues," as well as "additional technologies and drug detection methods to expand efforts to intercept fentanyl before entering the country." Although the commission does encourage seeking opioid alternatives for chronic pain treatment, it stops short of endorsing one prominent but controversial solution: marijuana. It "acknowledges that there is an active movement to promote the use of marijuana as an alternative medication for chronic pain and as a treatment for opioid addiction," but insists that there is a "lack of sophisticated outcome data on dose, potency, and abuse potential," pointing to an NIH study which indicated that marijuana use led to a 2.5 times greater chance that the user would subsequently use or abuse opioids. Wade, for her part, was cautiously optimistic about the use of marijuana for pain treatment, but very clear that it was hard to be sure either way. "I think it has great potential to be," said Wade, when asked if marijuana could be a supplement or alternative to opioids for pain treatment. "The way marijuana's regulated now, you can't really get a predictable dose response in the way you can get a predictable dose response for pretty much any other drug out there… just the way it's regulated, we can't predict it. But I do think there’s a lot of potential there," she said. Murray considered the commission's stance "appropriate caution." He alluded to studies that indicate early marijuana use "primes the brain for sensitization to opioids when exposed to it," and that marijuana may be tied to use of other drugs. "Can you show that [marijuana] actually reduces opioid overdose and use? No, the literature hasn't gotten there, and I think the Christie commission was correct in saying ‘there's some suggestion, but this is not very solid,'" he said. The White House applauded the commission's work. "We are grateful for the commission's extensive work since March, and look forward to reviewing these recommendations as the entire Administration continues to work to lessen drug demand and the opioid crisis," a statement from the White House read. This entry was posted in Issues and tagged Chris Christie, Opioids. Bookmark the permalink.